We absolutely love when customers send us photos of their dogs and pictures of them loving their purchase from us. But there are some photos that we especially love. Our most favorite photos are the ones we receive from customers on their most special day – their wedding day! 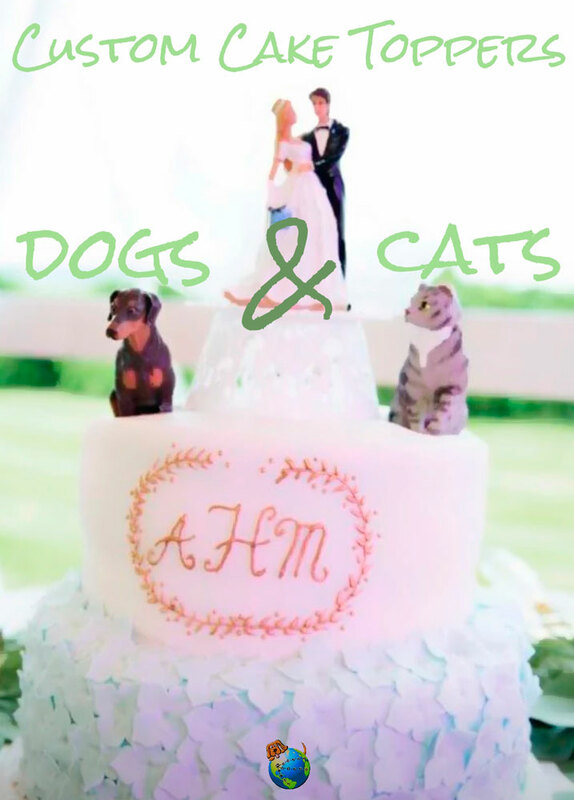 Customers love to find ways to incorporate their dogs (and cats) into their wedding day. Some choose to have their dog walk down the aisle as a “ring bearer”. Others choose to have their dog dress up and join them in their wedding photos. Our customers like to have their dogs featured on top of their wedding cake! That’s right, ON their wedding cake! We offer figurines that can be custom painted to look like our customer’s dogs. They are the perfect size to place on top of a wedding cake. Customers send us photos of their dogs and then we custom paint our figurines to match the photos of their dog. We even have cat figurines available for our customers who are both dog lovers and cat lovers. We offer cats because many times, customers will have both a dog and a cat that they love and they want to include on their wedding day. By offering both cat and dog figurines, we are able to give our customers two custom painted cake toppers that are of a similar style and size. We always recommend to put the figurine on top of a base or a piece of parchment paper to separate the figurine from the icing on the cake. This will help maintain the integrity of the figurine for the future, as well as preventing contact between the icing and the figurine. The paint we use is not food grade safe. Below you can view a photo from one of our customers who used two of our custom painted figurines on her wedding cake. A Doberman Pinscher figurine and a gray tabby cat figurine. Isn’t it adorable? She was able to include both of her fur babies on her wedding day. Both of the figurines were custom painted based off photos she sent to us. Some of our customers choose to just purchase our figurine “as is” and use them on their cakes without having them custom painted. This works when customers have dogs that look similar to our standard figurines. For example, American Eskimos and Weimaraners typically don’t have much coat and color variation. Breeds like this don’t need to be custom painted because they already look similar enough to our customer’s dogs. Check out all of our figurines that can be custom painted.